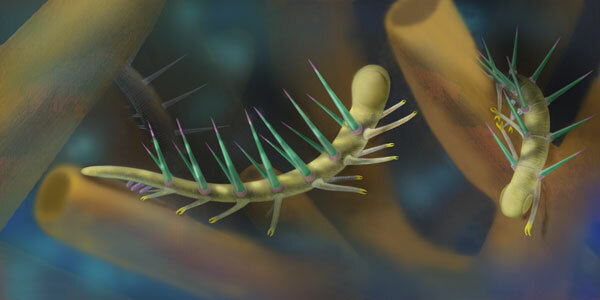 Life Before the Dinosaurs: Hallucigenia. Hallucigenia was a strange lobopod that probably fed on sponges, like Hazelia and Vauxia. The name is pronounced huh-loo-suh-JANE-ee-uh or huh-loo-suh-JEN-ee-uh. Nobody knows what end of Hallucigenia was the head. 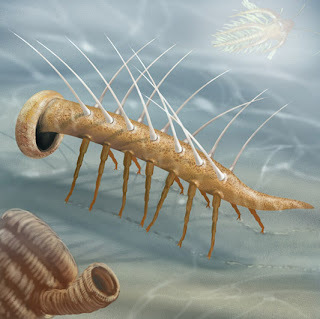 Another thing that is mysterious is that no one knows if Hallucigenia swam or crawled. 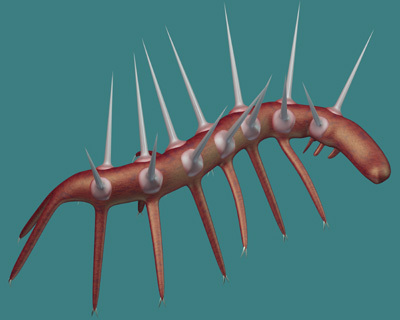 Hallucigenia had strange spines sticking out of its back. There was one row of spines on each side. Those spines could have been very useful because many predators fed on lobopods because they were so slow and small and soft. Most of them were almost defenseless. Also- what is a lobopod? A lobopod is an extinct walking worm. There are still lobopods today, in fact! (http://en.wikipedia.org/wiki/Lobopodia) They're called velvet worms and live on land. They hunt insects and other arthropods, and capture them by spraying a sticky glue-like substance: http://www.wired.com/wiredscience/2011/02/in-the-web-of-the-velvet-worm/ Very cool!